One of the most popular posts of 2008 on this blog was the one I wrote on TaskPaper in February. So I was excited when I was notified by a comment here that TaskPaper 2.0 was out. What I love about TaskPaper is that it’s a truly simple application that lets you get things done and out of the way quickly (and without a lot o “system”). It also is formatted in text, so any text editor on any platform can be used to edit these lists. * Feels a lot faster! I’ve used the new version for most of this week and found it extremely easy to fit into my workflow. As a GTDgirl – I love the themes, even though I use the basic look and feel (to keep distractions at bay). Take a look at this screencast for an overview of how TaskPaper works. Hog Bay Software has done a great job with this upgrade on a terrific application. The developers are also incredibly responsive on support issues. All in all – well worth $29.95! 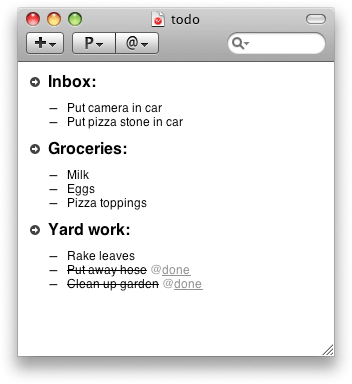 A few months ago I received an email asking me to check out this new to-do list application, TaskPaper. I’ve been using OmniFocus which is a full-featured GTD app. But sometimes you need something simple that allows you to just get your job done. TaskPaper takes the principles of GTD and uses a clean user interface with the focus of an outline to easily organize projects and tasks. Project titles and tags are all hyperlinked to create easy filters to find whatever you’re searching for with a click – whether you have a couple of projects or thousands of tasks. TaskPaper is a great application for down and dirty project management – and makes your life easier at the same time.